The 3-star Hotel Villa Fulgida in Cattolica is a historic villa with dependence set in a large, tree-lined garden overlooking the sea. The structure is managed by the owners and is characterized by the unique location of its kind. It offers themed evenings in the garden, services for children and accepts small pets. 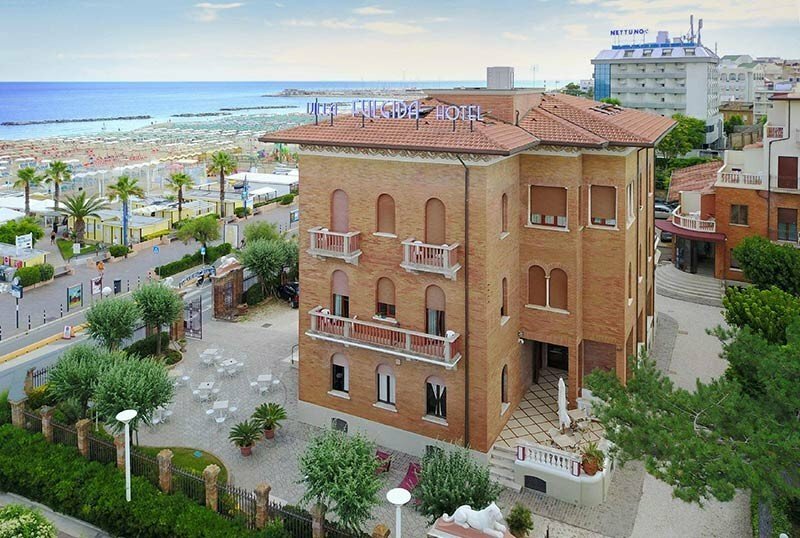 The hotel is located in the center of Cattolica, on the Rasi Spinelli promenade. It faces from one side on piazzale I Maggio, on the other on the seafront: to reach the beach it is sufficient to cross the street. The rooms are located partly in the villa and partly in dependency. Refined the first, more modern the others, all have a balcony and panoramic terraces, flat-screen TV from 22 "to 32", direct telephone, WI-FI, double glazed soundproof windows, bathroom with shower and hairdryer, air conditioning with autonomous regulation, REI access door. VILLA FRONT SEA: they are located on the first and second floor of the villa and overlook the sea. They can be double, triple and quadruple. VILLA CLASSICA: they are on the first and second floor, with a view of the garden, on Piazza I Maggio or side sea view. They can be double, triple and communicating. LUNGOMAR DEPENDENCE: they are located in the dependence, between the first and the third floor, served by a lift. They can be double, triple and quadruple. GARDEN FAMILY: they are located in the most modern building, near the playground area, and have direct access to the garden. They have balconies overlooking the garden and the same services as the previous rooms (without REI socket). They can be triple and quadruple. Large flowered garden with trees for relaxation, open-air porch, sun terrace, free use of bicycles, bar, elevator, reading room, ironing room and laundry, theme nights. PARKING: covered at 1.5 km with free shuttle, uncovered in the hotel, garage under the square (all for a fee). WI-FI: high speed throughout the structure. AIR CONDITIONING: free in the common areas and in the room. BREAKFAST: sweet and savory buffet set up under the loggia with pies, cakes, cold cuts, cheeses, eggs, coffee drinks. LUNCH AND DINNER: 3-choice menu with typical Romagna dishes, homemade pasta and desserts, salad buffet and fresh fruit. OTHER: theme nights with dinner in the garden, "romantic evening" by candlelight, "Romagna evening" with local dishes, "Mediterranean" with dishes from other countries. Other themed dinners: "pirates", "Hawaiian", "magic". In hotel: indoor / outdoor playground area, entertainment after dinner, strollers. Baby sitter and pediatrician on request. In the room : cots, safety rails, baby baths, bottle warmers. At meals: baby menu, baby food, kitchen for mothers, high chairs, saucers, glasses, bibs, vegetable broth and vegetable soup. Early opening of the restaurant. On the beach: playground, swimming pool, spring carpet, inflatable, baby / mini / junior club, live entertainment. The affiliated beaches n. 40-41 and 42 offer to the guests mini-club, games of every kind for the children, mini swimming pool, spring carpets, playgrounds, WI-FI, gym, pedal boat rental, windsurfing, motor boats.